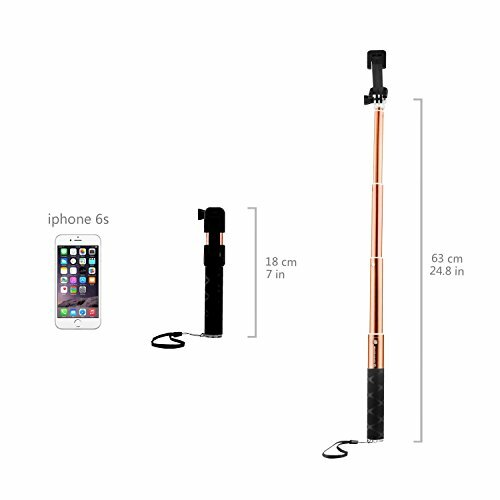 Capture every precious moment with this portable selfie stick. Color: Orange. Extended Length: 63cm/ 24.8 inches. Folded Length: 18 cm/ 7 inches. Material: Aluminum Alloy. Lightweight: Only 110g. 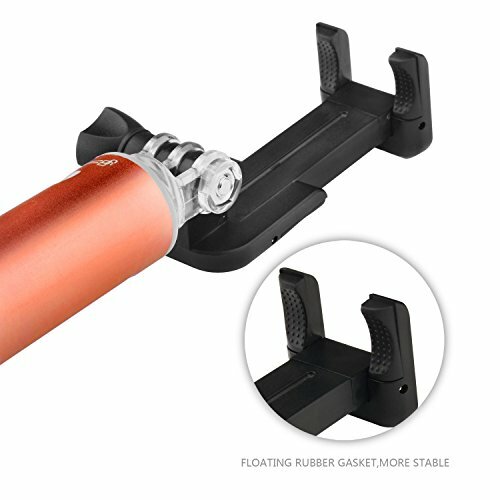 Adjustable clip is suitable for phones within 2.2- 2.9 inches in width. Compact size and lightweight, truly portable and you can just put it into your pocket. Special "twist and lock" design, allows quick and easy adjustments of the pole to any fixed length. 270 Degree Rotatable axis offers more user control for optimal angled pictures. Simple to use and hold your phone firmly. Attaches easily to any camera with a standard tripod socket. With this selfie stick you can take your selfie anytime and anywhere. INSTEN® is a registered trademark. Only authorized seller of INSTEN® can sell under INSTEN® listings. All rights reserved. All trade names are registered trademarks of respective manufacturers listed. Compatible with Alcatel One Touch Elevate / Evolve 2 / Evolve 5020T / Fierce / Fierce 2 7040T / Pixi 3 (4.5); Apple iPhone 4 / 4S / 5 / 5C / 5S / 6 / 6s Plus / SE; ASUS Zenfone 2E; BlackBerry Q10 / Q5 / Z10; Coolpad Rogue; GoPro HD HERO 2; GoPro HERO 1 / 3 / 3+ / 4; HTC Windows Phone 8X; HTC Desire 510 / 520 / 526 / 610(ATT) / 612 Verizon / 626 / 626s; HTC EVO 4G / Shift 4G; HTC One M7 / M8 / S / X / XL; Huawei Ascend Plus H881C; Kyocera Hydro Wave; LG Destiny / G2 / G2 Mini LS885 / Google Nexus 4 E960 / Google Nexus 5 D820 / D821 / Leon / Optimus Exceed 2 VS450PP Verizon / Optimus F3 LS720 / Optimus F5 / Optimus F6 / Optimus F60 LG Tribute LS660 / MS395 / Transpyre VS810PP / Optimus F7 LG870 / Optimus L70 MS323 / Optimus L9 MS769 / Optimus Zone 2 VS415PP / Power / Risio / Sunset / Tribute 2 / Volt LS740 / Volt 2; LG Optimus L90; Microsoft Lumia 435 / 640; Motorola Droid 2 / 3 / 4 / Bionic / Maxx XT1080M (Verizon) / Mini / Razr; Motorola Moto E(2nd Gen) / G(1st Gen) / G(3rd Gen) / X(1st Gen) / X(2nd Gen); Nokia Lumia 1020 / 630 / 635 / 928. User-Friendly - Special "twist and lock" design, allows quick and easy adjustments of the pole to any fixed length. Compact size and lightweight, truly portable and you can just put it into your pocket. 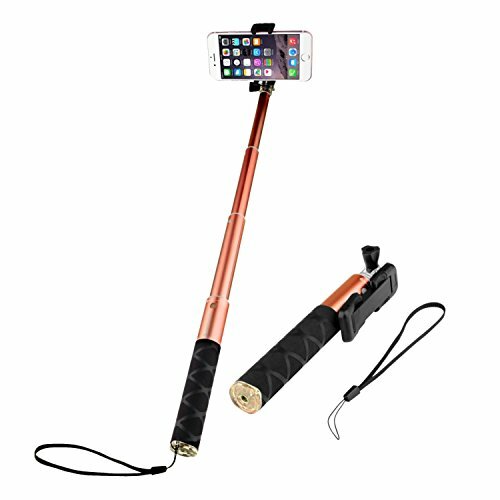 With this selfie stick you can take your selfie anytime and anywhere. Waterproof - Contains no electronic parts so you can use it even under water. The rust free aluminum construction will ensure that the pole will remain clean and usable even after using in salt or fresh water. No Battery No Bluetooth No Remote No Charging so no worry to get wet. 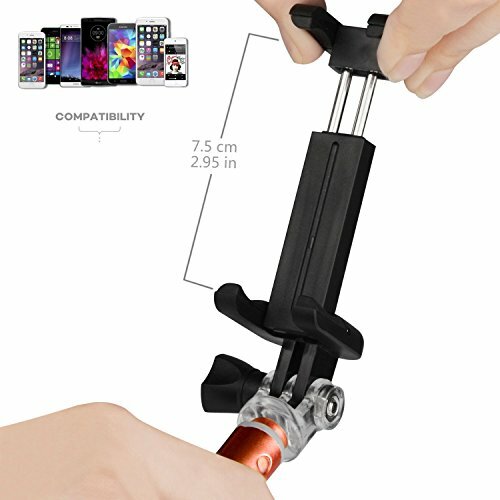 Universal - Adjustable clip is suitable for phones within 2.2- 2.9 inches in width, like iPhone 4 or iPhone 6S plus. Attaches easily to any camera with a standard tripod socket. Extended Length: 63cm/ 24.8 inches. Folded Length: 18 cm/ 7 inches. Lightweight - Only 110g. Same weight of two eggs. 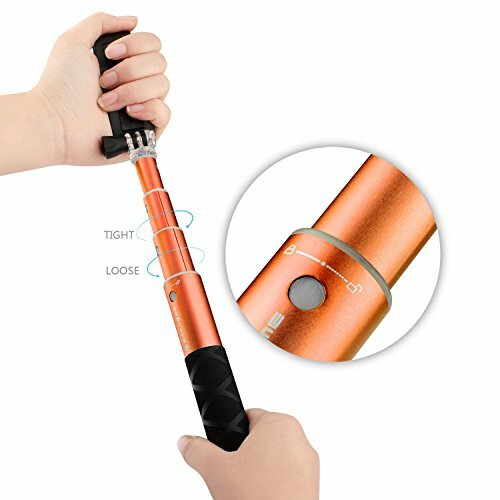 It is light but it will hold your phone firmly so you can capture every precious moment with this portable selfie stick. 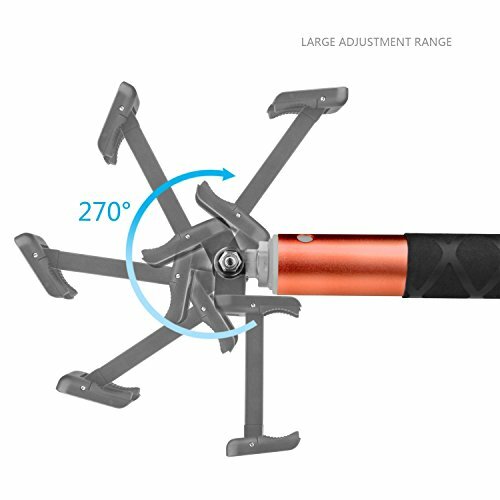 270 Degree Rotatable axis offers more user control for optimal angled pictures. Note: Screw for GoPro is not included. Material: Aluminum Alloy. Please cleanse with fresh water after using in salt water. Package Includes: 1 x Extendable Portable Handheld Selfie Stick. Color: Orange.